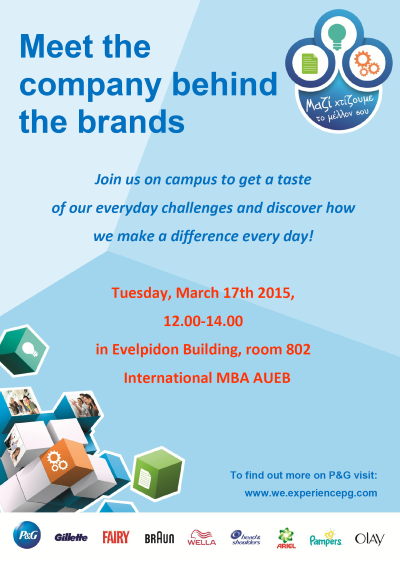 We are pleased to announce the organization of a Procter & Gamble Company Day, which will take place on Tuesday, March 17th,12:00 to 14:00 (Evelpidon building, room 802). P&G representatives will give an overview of P&G around the world and in Greece, its brands and their success story. Their recruitment process is valued and respected in the industry and you will gain an invaluable “inside view” of the process and what the company looks for in candidates. The event will also include a case study in finance. To register, please send an e-mail at imba@aueb.gr or contact us at 210 82 03 659. You probably use P&G products without even knowing it. But you can do more than use our products: you could be creating, manufacturing, promoting or selling them. P&G has 121,000 employees worldwide, representing over 140 nationalities, so we can offer a huge array of careers in a flexible and inspiring environment. We believe the one factor that has enabled P&G to survive and thrive for so long is our Company’s Purpose. In and of itself, this Purpose is not especially unique. Lots of companies have similar aspirations. But there are two things that set P&G’s Purpose apart: our Purpose has been remarkably consistent from the time this Company was founded in 1837. More, our Purpose is pervasive. It guides and inspires everything we do at P&G. Committing ourselves to “Touching and Improving Lives, Now and for Generations to Come” inspires our performance as professionals. It captures our imagination and passion. It focuses us on the people we serve and inspires empathy for them. It helps us identify the tensions in people’s lives that we can help resolve – tensions such as the trade-off between product performance and quality… and the desire to protect the environment. If we understand these tensions, we can develop the insights that lead to big innovations.